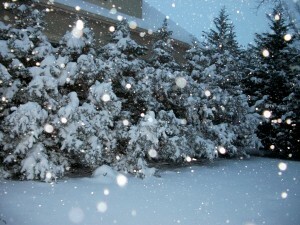 What can I say, it’s Winter Time!! But what a difference a day makes!! 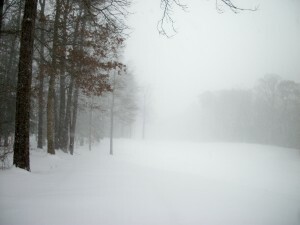 Yesterday, I was driving around and taking pictures of Silver Lake in Rehoboth Beach and today I cannot even drive. 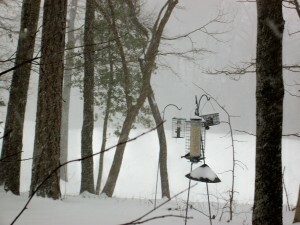 The snow is deep, it is windy and cold. But most of all, it is very quiet. 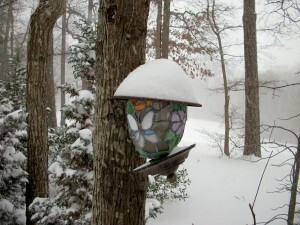 As the evening embraced the Delmarva Peninsula, the snow got deeper and heavier. 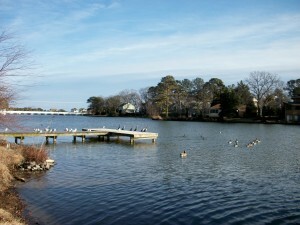 Silver Lake is a small pond that is nestled amongst the cottages on one side and the beach estates on the other in Rehoboth Beach. It offers a thrilling close look at a variety of wintering duck species. It is a bird refuge. You will find a lot of Canvasbacks, but it is also a reliable place in the state to find Redheads. 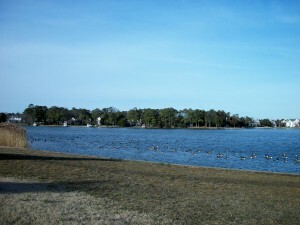 Ruddy Ducks and Mallards are in abundance along with different types of gulls and other waterbirds. 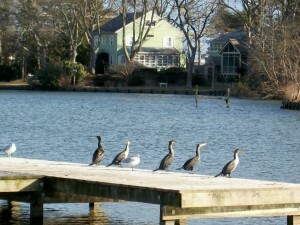 If you are visiting downtown Rehoboth, you will probably come through Silver Lake. In the morning visitors, locals and natives alike are walking their dogs, jogging, power walking and just enjoying another day at the beach. I was driving around Rehoboth yesterday and took the following pictures not realizing that a post was in the works. 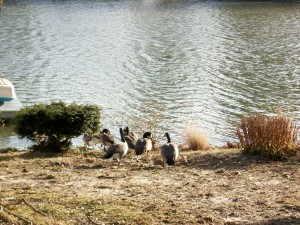 The waterfowl is at peace waiting for the winter storm which should be arriving today. Should we plunge? We are not Polar Bears. Better yet, let's fly in!! 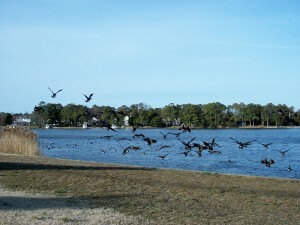 Note: Information on Silver Lake was taken from www.delawarebirdingtrail.org. Just a few specks of snow falling, but nothing noticeable yet. Have a great Saturday and talk to you later…. Where has time gone? It seems just like yesterday when we were celebrating the opening of a new restaurant in Bethany Beach. I say it this way because at the time I was living in Bethany. 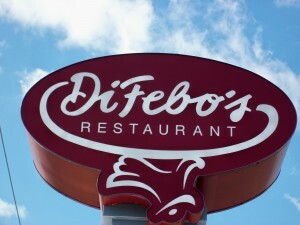 DiFebo’s opened 20 years ago. Yes, the year was 1989 and they have been serving the Bethany Beach area since then. 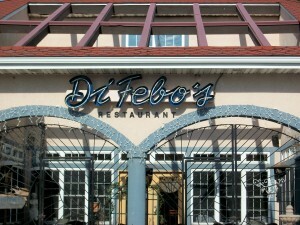 DiFebo’s is located at 789 Garfield Parkway (Rt. 26) in Bethany Beach, DE 19930. Tel. is 302-539-4550. For carry out please call 302-539-4914. The website is www.difebos.com. 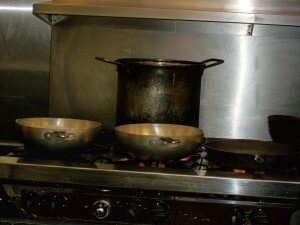 The Executive Chef is Ricardo Jimenez and you may e-mail him at ricardo@difebos.com. Remember when I mentioned the group of friends called the Usual Suspects? Well I went to meet 2 of them; Debbie and Shelley. We decided on DiFebo’s because none of us had been there in a long time. I really don’t remember when I last ate there but I don’t have a reason why I have not been there in such a long time. It really has been years. Well, enough of that. I am glad we went because we all had an excellent meal. Upon entering the restaurant, I noticed that it still looked the same. The dining area where we were directed was a little too dark, too many tables; I was not crazy about the decor; it’s just my own particular taste. I was not there for the decor so that did not matter much. Sergio was our waiter. I noticed he had an accent. He told us he was from Chile and so I spoke to him in Spanish. He was nice and very attentive. Last Tuesday there was a special going on; soup, salad, entree and dessert for $19.95. Debbie had the Chicken Marsala and Shelley had the Mahi Mahi with shrimp, asparagus and risotto. Sometimes, when restaurants offer these specials, their portions tend to be smaller. DiFebo’s portions were just the right size. I chose their House of Greens which was a salad of field greens, classic balsamic vinaigrette and imported Parma cheese. Light and perfect for a starter. My dish was not on the special but was very reasonable, as well. I had the Fresh Fish of the Day with Mussels en Brodo. 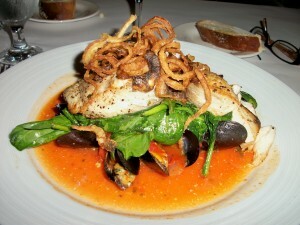 The fish was Mahi Mahi and it was grilled over pan-roasted mussels gently poached in a saffron broth with San Marzano tomatoes and fresh spinach. Garnished with frizzled leeks. The word “en Brodo” means “in Broth”. All I can say is that it was delicious. The dessert that my friends chose was the bread pudding. I took a few bites and it was not too sweet and had just the right density. 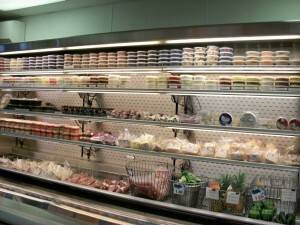 DiFebo’s has plenty to choose from. They are open daily and even deliver. Their Lunch & Carry Out Menu, as well as their Dinner Menu can be found on their website above mentioned. 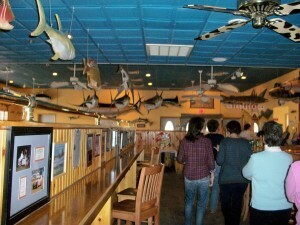 This family owned and operated restaurant has a unique feature for the beaches. They have Family Style Meals to Go. This catering menu is designed for parties of 10 guests or more. They have created affordable, hot delicious food that can go from their kitchen to yours; ready to serve. You can pick and choose your trays. Have them delivered or for pick up. You can even let them know if you are in need of a chaffing dish to keep the food warm. I have never used this service but I can imagine how popular this is, especially, at the height of the summer season. How convenient!! Isabella’s, next door, is their sister restaurant. I will review that one at another time. It started with my husband watching the Food Network Channel. All of a sudden they were talking about a restaurant in Bal Harbour called La Goulue; a replica of a Parisian bistro with the best cheese souffle. Well, that is all it took. 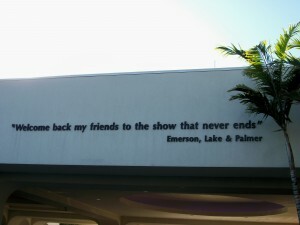 We wanted to go there, especially after watching the t.v. show and drooling at the site of such a magnificent dish. Since we were in Florida, at the time, we were willing to drive over an hour to try La Goulue. I called the restaurant to find out if the souffle had flour. I thought that it might. I have never made one. Well, of course, it did, and you already know that in my household we eat gluten free, which means no wheat, flours and derivatives thereof. Well, that was a short trip!! The word souffle is the past participle of the French verb souffler, which means to blow up or puff up. This is what happens when you combine egg yolks, egg whites and other ingredients. An enriched sauce with egg yolks and lightened with beaten egg whites, is what it is. My husband kept dreaming about the cheese souffle and tonight his dream came true. 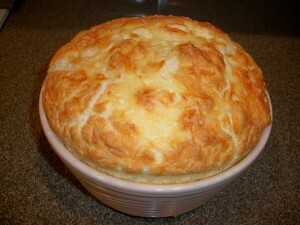 The following recipe is Gruyere and Parmesan Cheese Souffle. I have substituted the all purpose flour for a Gluten Free All Purpose Baking Mix made by Arrowhead Mills. It worked perfectly and the rest of the ingredients are gluten free as well. I hope you like it. It was so easy to make. Grated Parmesan cheese – Buy a good wedge and grate it, finely, yourself. 5 tablespoons Gluten Free All Purpose Baking Mix. If you don’t have an allergy, then use all purpose flour. Position rack in center of oven and preheat to 400 degrees. Generously butter one 10-cup souffle dish; sprinkle with Parmesan cheese to coat. Melt butter in heavy large saucepan over medium heat. Add flour, cayenne pepper and nutmeg. Cook without browning until mixture begins to bubble, whisking constantly, a little over 1 minute. Gradually whisk in milk, then wine. Cook until smooth, thick and beginning to boil, whisking constantly, about 2 minutes or so. Remove from heat. Mix yolks, salt and pepper in a small bowl and add the mixture all at once to the sauce and whisk quickly to blend. Fold in 1 1/4 cups Gruyere cheese and 1/4 cup Parmesan cheese (cheeses do not need to melt). 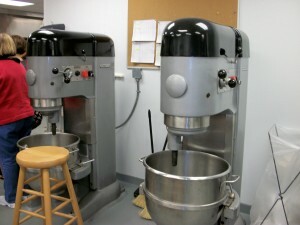 Using an electric mixer, beat whites in a large bowl until stiff but not dry. 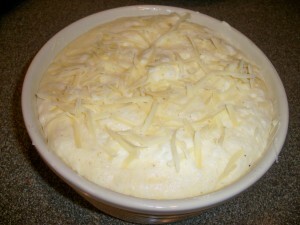 Fold 1/4 of whites into the souffle base to lighten and then fold in the remaining whites. Transfer mixture to prepared dish. Sprinkle with remaining 2 tablespoons of Gruyere cheese. Place souffle in oven; reduce heat to 375 degrees. Bake souffle until puffed, golden and gently set in the center. This will take about 45 minutes. Take it out of the oven and serve immediately. I think your guests will be very impressed. This is the type of dish that can be served with a salad and a green vegetable like asparagus, which is what I did. Remember make the recipe your own; adjust it to your needs. Note: This recipe was taken from www.epicurious.com and the information on the word souffle was taken from http://en.wikipedia.org/wiki/souffl%C3%A9. 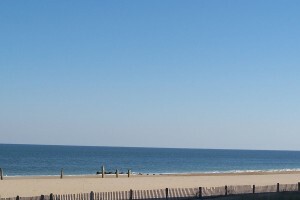 Enjoying the quietness of the Delaware and Ocean City, Maryland beaches is something that a lot of us cherish this time of the year. Restaurants are open; maybe a few might close for some weeks for a well deserved break and people are still heading to the outlets for those last bargains. Zumba – If you want to add a little spice to your exercise routine this is something you might like to try. Zumba has been added to exercise classes around the country. It is a fusion of Latin and International Music that makes you move and have fun at the same time. Stacy Fulton holds her Zumba classes at the Plantations Clubhouse located at 18474 Plantations Rd., Lewes, DE 19948. Tel. 302-245-4262. Website: www.clubhousetheplantations.com. Her classes are held on Mondays and Thursdays from 5:30 – 6:30 p.m., Wednesdays and Fridays they are at 9:30 – 10:30 a.m. Note: There are no classes this week. Zumba will resume on Wednesday, February 3rd. Safe Haven – A No Kill Animal Sanctuary – This is a 501(c)(3) non- profit group dedicated to providing a no-kill environment for abandoned and abused cats and dogs in Sussex County. By December 2010 they are planning to begin operations in their new building. Construction is starting this spring. Their new building will be on Shingle Point Rd., off of Rt. 9. 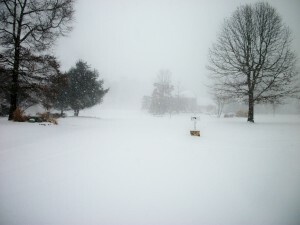 For more information, please call 302-856-6460 or visit their website www.safehavende.org. Poker at the Beach – Saturday, February 27th from 6:00 p.m. until Midnight. Location is at the Lighthouse Shopping Center located on Rt. 1 in Rehoboth. Poker at the Beach will donate a portion of their proceeds to Safe Haven. 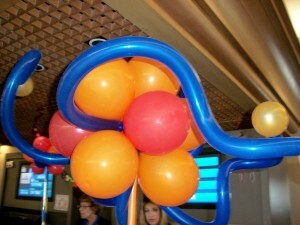 Wednesday, March 3rd – Bus Trip to the Philadelphia Flower Show to benefit Safe Haven. This year’s theme is “Passport to the World”. The bus will transport you on this day at a cost of $65. This will include the admission ticket to the flower show and a contribution to Safe Haven. Safe Haven is taking reservations now at flowershow@safehavende.org. To keep the reservation, payments needs to be received by February 17th. You can either send a check made out to Safe Haven and write Flower Show Benefit Trip at the bottom of the check and mail it to: Safe Haven, P.O. Box 430, Nassau, DE 19969, or, you can go on www.safehavende.org and click the special “Pay Now” button for the Flower Show Trip on their home page in the Upcoming Events. The Safe Haven bus will leave from the K Mart shopping center at 8:00 a.m. and return by 7:00 p.m. on March 3rd. Let’s say you have a dog and don’t have anyone to take care of it on that day, then please call Doggies at the Beach at 302-644-8200, website www.doggiesatthebeach.com and make a reservation for that day and make sure you mention the Safe Haven Flower Show Trip for a discount. They are open from 7:00 a.m. until 7:00 p.m. and in case there is a traffic delay, they will be called and informed. Rehoboth Beach Film Society and the Milton Historical Society – Delmarva Roots. 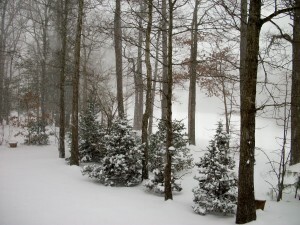 On a Friday in January, February, and March of each year this winter series take place. The featured films are about the rich history of the Delmarva region. Each event is held at the Milton Theater, located at 110 Union Street, Milton, Delaware. Milton is about 25 minutes north of Rehoboth Beach. For more info. please call the Film Society Office at 302-645-9095, ext. 1 or you may also call the Milton Historical Society at 302-684-1010. Admission for each film is $4.00. The first film will be on Friday, January 29th at 7:00 p.m. – Beer Wars – This film was at the Independent Film Festival. If you did not get a chance to see it, then this will be another opportunity. The rest of the films are in February and as the dates get closer I will let you know. “Beer Wars is a documentary that takes a no holds barred exploration of the U.S. beer industry that ultimately reveals the truth behind the label of the top selling beers. Told from an insider’s perspective, the film, goes behind the scenes of the daily battles and all out wars that dominate one of America’s favorite industries. Beer Wars begins as the corporate behemoths are being challenged by small, independent brewers who are shunning the status quo and creating innovative new beers. The story is told through 2 of these entrepeneurs, Milton’s own Sam Calagione, and Rhonda Kallman, who are battling the might and tactings of Corporate America. The film follows their struggle to achieve their “American Dream” in an industry dominated by powerful corporations unwilling to cede an inch.” This film is not rated and running time will be 89 minutes. Please visit www.rehobothfilm.com for more information on this and other film events. Friday through Sunday, 1/29 – 1/31 – East Coast Commercial Fishermen’s & Aquaculture Trade Expo. at the Ocean City Convention Center, 4001 Coastal Highway, Ocean City, MD. Tel. 410-604-0909. Visitors can find all types of gear, services and equipment that relates to inshore and offshore fisheries, as well as all facets of the aquaculture industry. There is an admission fee. Friday 11 – 6 p.m., Saturday 20 – 6 p.m. and Sunday 10 – 4:30 p.m.
Aquaculture is the raising and harvesting of fresh and salt water plants and animals; one of the most important being fish farming. Saturday, 1/30 – PETCO Adoption Day – 12 Noon until 5:00 p.m. – Paws of Tomorrow will be at PETCO located at the Ocean City, Maryland outlets, 12641-310 Ocean Gateway. Tel. for PETCO is 410-213-1929. Paws of Tomorrow is a rescue organization located in Ocean View, Delaware. I got my own Addy from this wonderful organization. Visit their website www.pawsoftomorrow.com and check their events and pets. If you see one that captures you then send them an e-mail and see if you can meet him or her at the event. Paws of Tomorrow is also on Facebook. Check them out. Liquid Assets Wine & Martini Bar located on 9301 Coastal Highway in Ocean City, MD has sent an e-mail announcing the Liquid Assets Lazy Dog Photo Contest. Send them photos of your dog being lazy on or near the beach. They will review the submissions and choose a winner. I reviewed this restaurant back in August 6th of 2009. If you would like to read the review please click on August and scroll down to the date. Visit their website www.ocliquidassets.com for more information. This is Destination Delray Beach, which will be hosting a special Pro-Bowl Kickoff Week-End Celebration.The 2010 Pro Bowl will be played one week before the Super Bowl on Sunday, January 31st, and both games will be at Dolphin Stadium. Mark Duper, “Super Duper”, who played 11 seasons for the Dolphins, and is a 3 time Pro Bowl veteran will also be on hand for the festivities. Thursday – January 28th – 6 until 10 p.m. – Super Art & Jazz on the Avenue sponsored by Downtown Delray Beach, (Along Atlantic Ave.) – Interactive contests including Punt, Pass & Kick; FAU football players, cheerleaders and Coach Howard Schnellenberger; football players, cheerleaders and the marching band from Atlantic High School; Delray Beach’s Rocks football players; Super Bowl merchandise and more. At the same time Latin American Vinofest will be starting. It will showcase wine tastings with hors d’oeuvres at 6′ long tables along the Avenue. Go to www.thevinofest.com for more info. Atlantic Ave. will be closed for 7 blocks. Friday, January 29th – 5 to 9 p.m. – Pro Players Meet & Greet and Tailgate Party. This will be along Ocean Boulevard, south of Atlantic Ave. Starting at 5 p.m., the Santaluces High School’s marching Chiefs Drumline, reigning champions of the 2009 Florida Marching Band Competition, will drum their way from Crane’s BeachHouse at 82 Gleason Street up to Atlantic Ave., east to Ocean Blvd., then a block or so south to the main stage, where they will perform a short but rousing percussion concert. During the last leg of their march, the drummers will be joined by a number of official NFL Players. Tailgaters can meet the Pro Football stars and get their autographs at the open Pavilion on Ocean Blvd. The restaurants Boston’s, Luna Rosa and Sliders will provide food and beverages for purchase, and ESPN 760 will broadcast live from the event. Live entertainment also will be provided. The Latin American Vinofest will have their winemakers dinner starting at 5:15 p.m. Unique food and Latin American wine pairings at participating restaurants. Again, please visit the above mentioned website. Saturday, January 30th – Green Market is held every Saturday morning from 8 a.m. until 1 p.m. in the street on SE 4th Ave., just South of Atlantic Ave.
Saturday, January 30th – 2:30 until 5:30 p.m. – Pinball Palooza Family Day: Pinball Meets Football!! – At the Cornell Museum of Art & Culture at Old School Square. Another chance to personally meet and greet the participating football greats. Spin to win a place in the Kids vs. Pro Players arcade game challenge. See amazing pinball machines and more. Free and ticketed game activities. $5.00 family admission (arcade games not included). Latin American Vinofest continues with the winemakers dinner starting at 5:15 p.m. Please visit www.thevinofest.com for more info. The Media Contact is Gary Schweikhart, PR-BS, Inc. Tel. 561-756-4298 or e-mail him at gary@pr-bs.net. 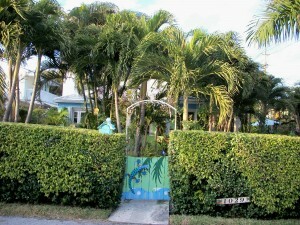 Definitely, Delray is a very busy Village by the Sea!!! Enjoy the rest of the week….Talk to you soon…. One of the nicest things about the second season, here at the beaches, is the laid back attitude we all get. Not lazy but really relaxed because it is quiet; being able to park anywhere, and no waiting lines, it’s such a treat. Don’t get me wrong, I love the visitors to our beaches and the energy they all project, but at this time of the year, I am really enjoying this. You know, “Cooking is like love. It should be entered into with abandon or not at all.” By Harriet Van Horne. 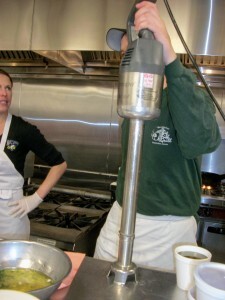 With that in mind, the Usual Suspects, signed up for a cooking class at Big Fish Grill. I wrote about this very popular restaurant back on December 11th. You can click on the left hand side of this blog, on that particular month and scroll down to that date in order to see it. 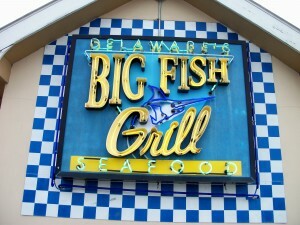 Big Fish Grill is located on 20298 Coastal Highway, Rehoboth Beach, DE 19971. Tel. is 302-227-9007. 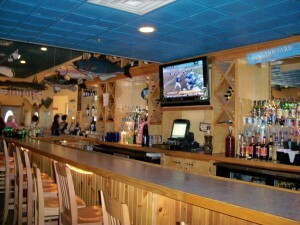 The website is www.bigfishgrill.com. The Usual Suspects above mentioned are a group of my friends that are ready to do anything on a moment’s notice. Debbie, Roberta, another Debbie and Brennan have accompanied me kayaking, to breakfast at Crystal in Rehoboth Beach, and to Liquid Assets in Ocean City, Maryland. Besides being good friends, we all have a strong interest in food and decided to go to this class, make the best of it, learn, and savour every mouthful of the coming feast. And, that’s exactly what we did. Big Fish Grill is one of those restaurants that is busy all the time. Summer season, second season, hurricane season, nor’ easter season, you name it; no rest for this group. 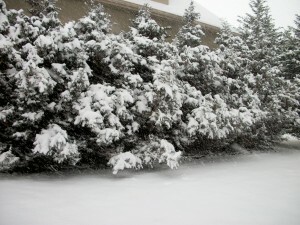 I like it best in the fall and winter. 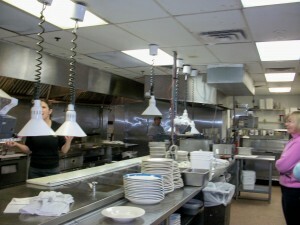 Susan, their manager, said today, you can kick back in their casual atmosphere and the restaurant is more subdued. In the summer it is busy. People coming and going; enjoying their food and out the door to explore whatever the beaches are offering. 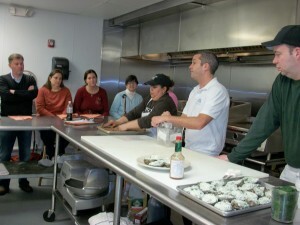 Big Fish Grill has been offering cooking classes and they have been well attended. Today’s class had about 22 people. Some of them had already been to these classes in the past year. 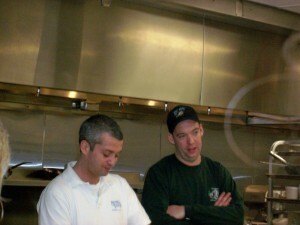 Our Chefs were Marcus and Joe. Susan was non-stop. She knows every aspect of the restaurant and its food preparations. They would attempt to give us the ins and outs of a very well run and organized operation; their techniques and suggestions. We all gathered in the main part of the restaurant and had coffee and baked goods. The agenda was as follows: An introduction, with a tour of Big Fish Seafood Market and the proper fish cutting technique. It was harder than I thought, but Fidel made it look so easy. We entered the seafood market where already every fish was perfectly displayed for the week-end. 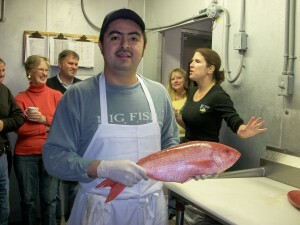 The only fish that is received frozen is the Chilean Seabass since it comes from Chile. Everything is made in-house with the exception of the candied nuts that go into some of their salads. Spices and dips are available for purchase. A favorite of mine is their smoked fish dip. Then, the appetizer demonstration with a Tuna Tartar with a Crispy Chip, Oysters Rockeffeler and an Arugula Salad with Lemon Thyme Vinaigrette. Heaven was near. 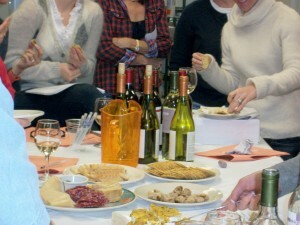 A discussion of pairing wine with food and cheese; then a wine and cheese tasting. 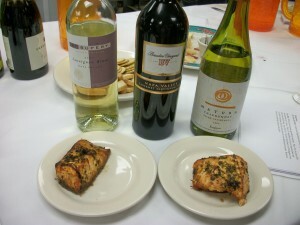 Susan told us that Big Fish wants to offer wines that complement a meal. They are not looking for mark-ups. Some of the ones sampled today were the Sauvignon Blanc called Saint Supery from the Napa Valley. A Chardonnay called Natura from Chile. A Cabernet called BV from the Napa Valley that was one of their heavier reds. And, a Pino Noir called Carmel Road. She suggested drinking the wine with cheese and enjoy the sensation it would produce. One of the cheeses that I really liked was called Morbier. This is a semi-soft cow’s milk cheese from France and it is named after the Village of Morbier in Franche-Comte in Eastern France. The color is ivory; it is soft and slightly elastic. You can recognize it by a black layer of tasteless ash separating it horizontally in the middle. Aging time for this cheese is 45 days to 3 months. 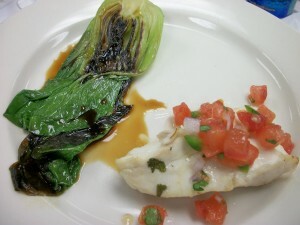 The entree demonstration was the culmination of the class with 4 dishes; Mojito Marinated Snapper with Pico de Gallo. Yes, that was the fish I fillet. Citrus Rubbed Salmon from the Summerhouse menu, Pan Seared Rib Eye with Horseradish Cream and the ever popular Big Fish Mashers. All fantastic dishes that were quickly devoured. The sweet ending was sinful. 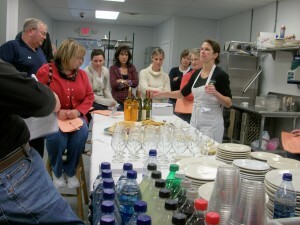 At the beginning of the class, Sandra made the brownies from scratch so they would be ready for dessert. 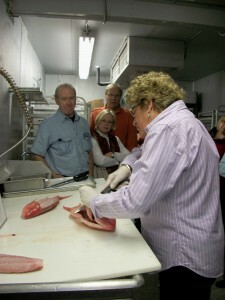 Sandra also handles the crabmeat for Big Fish. Can you believe this restaurant uses 600 lbs. of crabmeat per week in the summer? 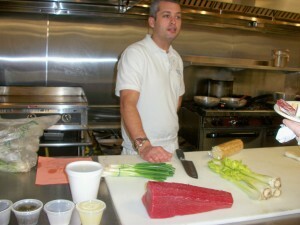 Big Fish Grill said that they are passionate about creating consistently good food everytime. They will tweak, improve, and develop recipes that will keep us asking for more. Their commitment to superior quality of ingredients, a dedicated staff and a friendly disposition made us really enjoy this day. Gracias a Sandra y a Fidel por su ayuda en este dia. Los “brownies” estaban deliciosos y aprendi como limpiar el pescado. Buen maestro, Fidel. Note: Please check the website for more information. 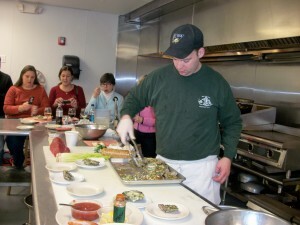 The schedule for the 2010 Cooking Classes is posted, as well as information on their other restaurants; the Summerhouse in Rehoboth Beach, the Big Fish Grill on the waterfront in Wilmington. Soon, another restaurant will be unveiled; Firestone, also on the waterfront in Wilmington. Be on the look-out. The information on Morbier was taken from http://en.wikipedia.org/wiki/Morbier_(cheese). We were given all the recipes taught in this class. As soon as I make some of them I will share them with you. And by the way, the following are some of the kitchen gadgets that you should not live without. Well, this post was a long one but how else could I have described it? See you soon…. Back in November, when I was visiting Delray I noticed that Historic Markers were around different areas of this Village by the Sea. I was so glad to see them. Delray Beach has wonderful neighborhoods and within those, are very unique homes and buildings erected when life was maybe more laid back; the buildings with more bones and character. One of the streets that caught my eye was Nassau Street. 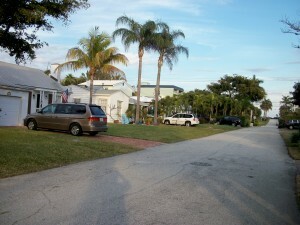 Great little street with easy walking access to the beach. Here is its story. 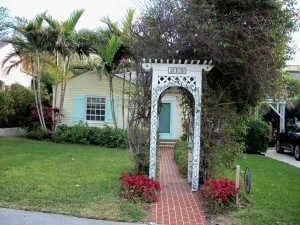 Nassau Park is Delray’s first locally designated Historic District. It spans 2 blocks along Nassau St., from South Ocean Blvd. to Venetian. It is approx. 3 blocks south of Atlantic Ave. In 1935, a newspaper ad for Ray-Del Realty Co. described Nassau Park as “West Indian Charm along Delray Shores.” It was originally named Jo-Jo Avenue, then renamed Nassau Street by developer R.C. McNeil, who commissioned architect Sam Ogren, Sr. to design the first house in 1935 and 1941. 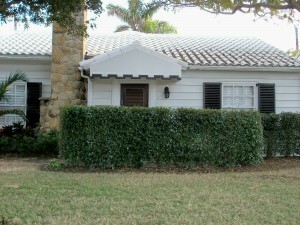 Sam Ogren, Sr. was Delray’s first registered architect. He designed residential and commercial buildings; among them the Delray High School built in 1925. It is now part of the Old School Square. He was also a classical pianist. 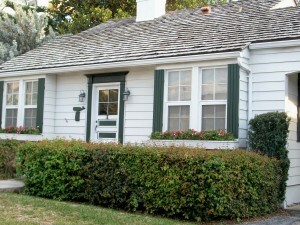 The cottages built are in the Colonial Cape Cod Revival Style. This style incorporated architectural detailing from early wooden folk houses of Eastern Massachusetts. 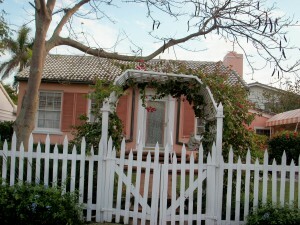 The original 18 houses, built then, have dominant architectural elements like accentuated front doors with overhead fanlights, and carved wood details. Nassau Street evokes a time during the 1930s when the “winter colony” relaxed in discreet, small scale cottages surrounded by natural beauty. “The district recalls the prosperity, pleasure, and style; the essense of the 1930 resort life in Delray.” A vital element in the aesthetics of the historic streetscape is the natural topography. 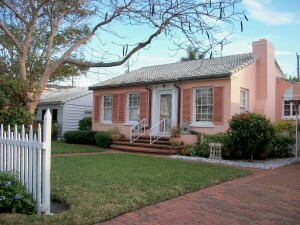 It is a Florida Heritage site sponsored by the City of Delray Beach, the Delray Historical Society and the Florida Dept. of State. 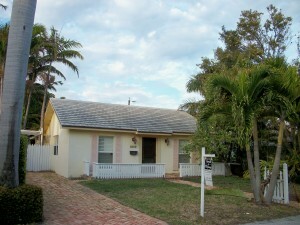 For more information please visit www.mydelray.com. There are also 26 individual listed properties that date from the late 19th century to the present. Please note that the Delray Beach Preservation Trust-Historic Marker Project has placed these plaques at sites that are of historical and visual interest to visitors. Please visit www.mydelraybeach.com and on the home page select Planning and Zoning under Departments and check Historic Preservation for more information. 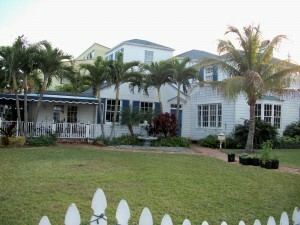 To me, having property in Delray Beach, means that I want to learn more about this great beach town that some years ago was once almost forgotten and thanks to the City and its people, this Village by the Sea is a South Florida destination for its restaurants, fairs, shops and friendly and relaxed atmosphere. It gave me joy to see those Historic Markers and the recognition they represent. Note: Information was taken from the Historic Marker, and the Delray Beach Preservation Trust. 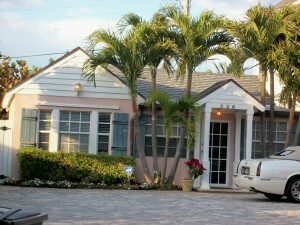 Please visit the Delray Beach Historical Society located at 3 NE 1st St., Delray Beach, FL 33444. For archives’ tours please call 561-274-9578 and for group tours of the Society please call 561-243-2577. Website is www.db-hs.org. 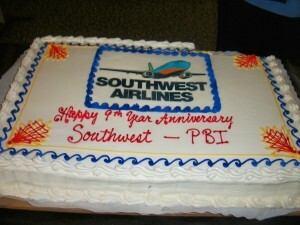 I arrived in Delaware but not before celebrating at the PBI airport where Southwest was hosting its 9th birthday with cake and balloons. See you soon….Cooking class tomorrow. Let’s see…I don’t gamble, drink or smoke, so what could I possibly be doing in a venue that is predominantly known for its Casino? I am blogging with an open mind. The word gambling creates heated discussions anywhere; its happening in Maryland and Delaware. I have told you before that I grew up in the island of Puerto Rico. People have been gambling in this small island for many years. Nobody thinks about it. Practically every hotel has a casino. And, I must admit they do have very nice ones. Many years ago jackets were required but like everything else, it is casual attire at present. How do I fee about it? It really does not matter, because a person that gambles will do so anywhere. That it brings more work for a state, a city, yes, and at the same time it creates jobs and revenues. Florida is still debating this issue. 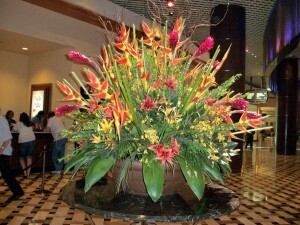 The Hard Rock Casino is owned by the Seminole Indian Tribe of Florida. “The Seminole Tribe of Florida is a Federally recognized Indian Tribe, the only tribe in America who never signed a peace treaty.” You can read this and more if you visit their website www.seminoletribe.com. As casinos go, the Hard Rock is very well run. Clean beyond belief; not a blade of grass out of place or a piece of trash anywhere. On this particular day, the casino was crowded and it seemed that the hotel was crowded, as well, with full families arriving. 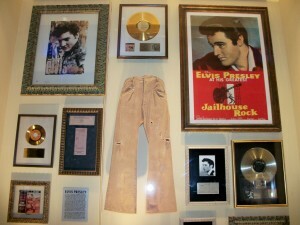 I am walking all over the place, checking out all the musicians’ garments that are displayed on the wall. After all, it is the Hard Rock, where music is non stop. And, as you come in, you will notice that it is a noisy place. Besides the music, the sound of slot machines is on going. They have 2,500 slots, 500 hotel rooms, 25 boutiques and 30 bars, restaurants and lounges. 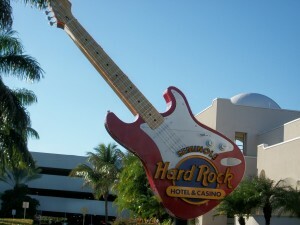 The Hard Rock Hotel & Casino is located on 1 Seminole Way, Hollywood, FL 33314. 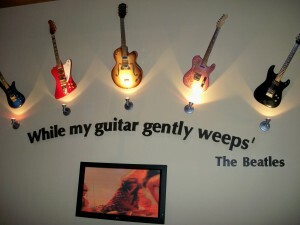 The website is www.seminolehardrockhollywood.com. 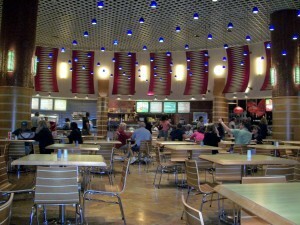 Right inside the gaming area you will see a very nice cafeteria for casual dining. Cuban, Chinese, Italian, etc. As you come out into the other side of the hotel, is a man made street with shops and restaurants on either side. Some of these are the Bluepoint Ocean Grill for fresh seafood and steaks by the lake, Bongo’s Cuban Cafe which will be opening in the Spring, Constant Grind for iced drinks, gourmet coffees, of course, the Hard Rock Cafe, Martorano’s which will be opening this year. Anyone that has been to Cafe Martorano’s in Ft. Lauderdale know how fantastic their food is. Check the website for more info. There was a wide variety of shops from women’s clothing to cigars, jewelry and even a skateboardig and surfing shop. I stopped at Scentsual Perfume, Inc. since I looking for a perfume called Bulgary for Men. I bought it for myself since it is a fresh and light fragance. If you enjoy wearing perfume everyday, this could be a signature fragance for you. Like many stores everywhere, sales are abundant. 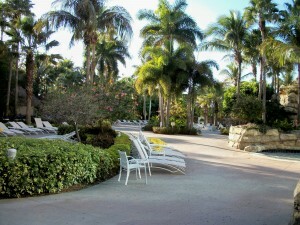 There is a beautiful and relaxing tropical Beach Club. 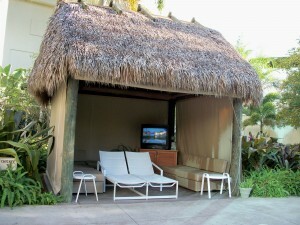 Available for rent are cabanas called “Chickee”. 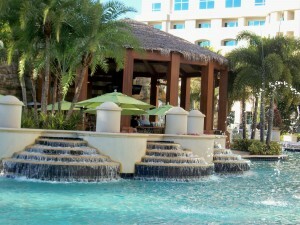 It is your own private living area by the pool with televisions and very comfortable lounges. The Hard Rock Hotel & Casino wants to be considered a South Florida destination; the 5,500 seat arena hosts some of the biggest acts from music to comedy. 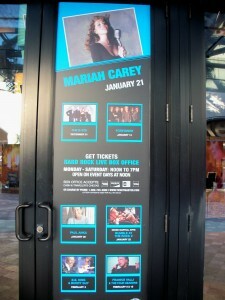 Just this week Mariah Carey, and coming up Paul Anka, BB King, and Frankie Valli and The Four Seasons. Let’s be realistic, this type of vacation is probably not for everyone, but for the people that do like it, then that’s great!! I will be coming to Delaware soon…so until then…talk to you later….